Since other shooters got to his pre-planned Bryce Canyon spot first, Tennant was forced to find a new angle for his Canon EOS 5D Mark II and 24–105mm f/4L Canon EF lens. Exposure: 1/4 sec at f/16, ISO 320. “Wait, this wasn’t supposed to happen!” I mutter as I swipe at my phone to bring up the weather app for the hundredth time this afternoon. The sky is completely clear and my chance at an epic sunset shot has disappeared. I’ve snagged a prime location based on intel from fellow photographers and the help of Google Earth. I knew where to be and when. I even checked the radar earlier in the afternoon and it was all so promising. Now there isn’t even a hint of drama in the sky as the sun begins to set. Sound familiar? Sure, landscape photographers occasionally reap the rewards of everything coming together. But more often than not we must contend with situations that fail to meet our hopes. When faced with poor weather or an obstructed view, creativity can mean the difference between a keeper and a memory card full of duds. Here’s my best advice for making great pictures in poor—and all-too-common—conditions. Tennant thought condensation on his lens would ruin his shot of Catskills, NY, but it ended up enhancing it. Final image is a stack of 80; Canon EOS 5D Mark II and 16–35mm f/2.8L Canon EF lens; 45 sec at f/2.8, ISO 2000. Given the physical toll of being in the field all day combined with subsisting on trail mix and warm water, you may be tempted to abandon a shoot at the slightest hint of bad weather. But having the discipline to wait it out can be extraordinarily rewarding. In fact, some of my favorite photographs were a result of conditions that would’ve caused a younger, less patient me to abandon ship. Overcast skies and light rain at sunrise? Wait and see if the clouds part. My neatly framed view of Mt. Rundle in Banff National Park, required such patience. Once, while in the Adirondack Mountains under an underwhelming sky, a rain shower suddenly swept in and I began my retreat from the summit. As I happened to glance sideways, however, I saw a brilliant double rainbow nearly close enough to touch. This led me to scamper like a lunatic back up the mountain, firing off as many shots as I could. I’ve never been so happy while cold and wet. 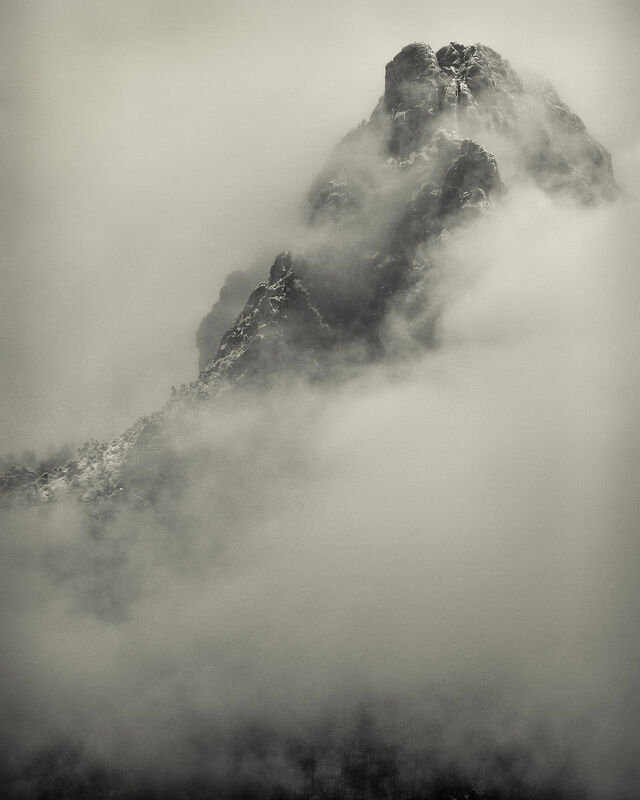 The summit in Zion National Park was socked in, but Tennant waited for the fog to work. Shot with a Canon EOS 5D Mark II and 70–200mm f/2.8L Canon EF lens. Exposure 1/20 at f/11, ISO 640. A completely socked in, overcast, or foggy day may make you want to head for home, too. Your morale can take a hit when hiking with the expectation of expansive views, but stay on the course and work with the bad weather: Create compositions that minimize the sky while placing the primary focus on the foreground. Perfectly clear skies can be just as challenging as fog, rain, or cloudiness. So what do you do when you can kiss any chance of a magnificent sunset goodbye? Shoot after sunset. Twilight produces beautiful coloration in the sky in shades from blue to purple. Your pictures will be subtler than with the dramatic sunset you imagined, but you may still get a keeper. Since you will lose light quickly, set a longer exposure to enhance the cool colors. If water plays a significant part in your composition, take advantage of its ability to transmit those tones throughout the rest of the scene. 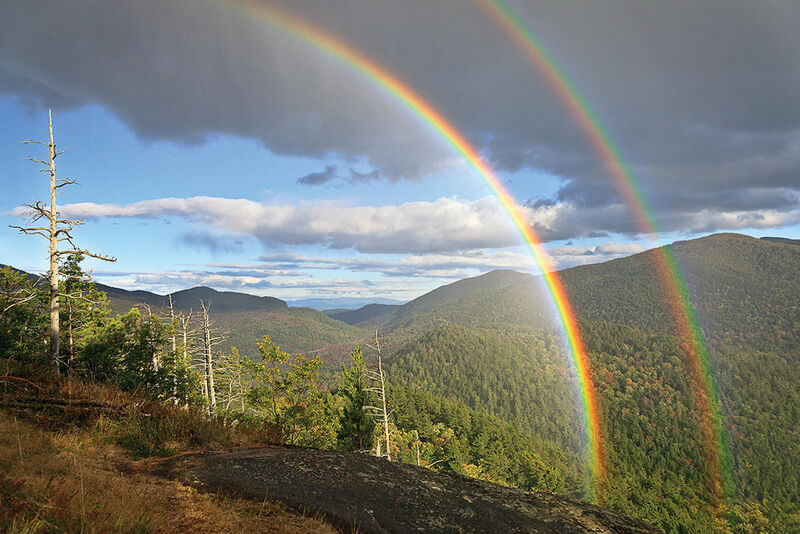 Tennant almost left and missed these rainbows in the Adirondack Mountains. Canon 5D and 24–105mm f/4L lens. Exposure: 1/400 sec at f/8, ISO 640. Some locations rely so completely on an interesting sky that if one never materializes it can be difficult to find a compelling landscape shot. Miles of unbroken beaches, for example, make many coastlines ideal for a relaxing vacation, but unless you find some drama above, they offer little in the way of compositional interest. During one particular pre-dawn stroll on the Outer Banks in North Carolina, I hoped to capture the experience of a sunrise at the ocean. But with so little to work with, how? 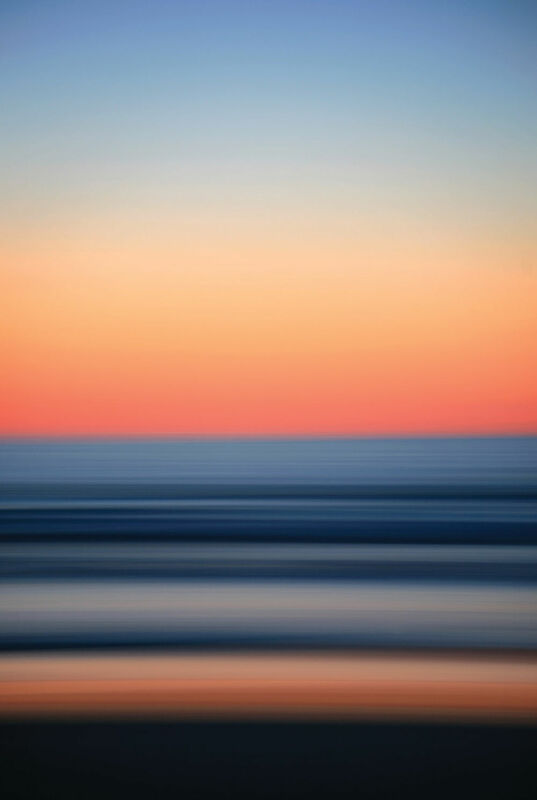 A lovely palette of colors dawned, but a static shot of the ocean and a cloudless sky would be dull and uninspired. Instead I took an abstract approach, stopped down my aperture to f/22, and began to pan the camera horizontally during the exposure. What resulted were swaths of alternating colors of both cool and warm tones, which captured the essence of that morning on the beach. This North Carolina beach scene (opposite) was boring, but the light was nice. So Tennant went abstract. Canon EOS 5D and 24–105mm f/4L Canon EF lens; 1.6 sec at f/4, ISO 100. 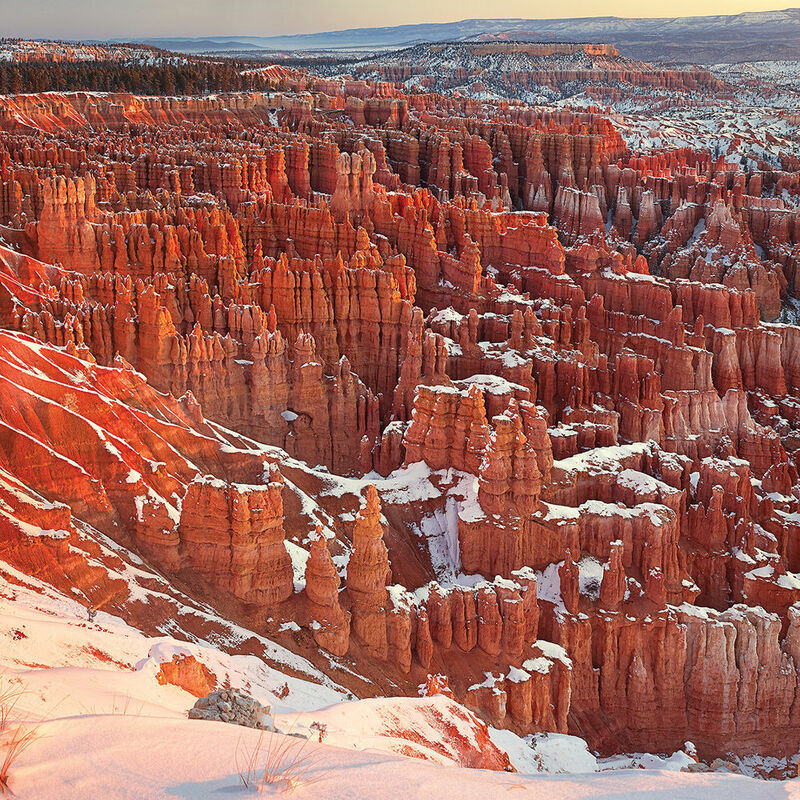 You might think that arriving well before dawn in sub-zero temperatures at Bryce Canyon National Park would be sufficient to snag prime real estate. Yet when I got there, all the “best” spots were marked by rows of tripods. Even after many years of photography I can still be a victim of the herd mentality, congregating with all the other photographers. In this case I was forced to stake out a spot on my own. I didn’t do anything wild—I simply moved away from the pack by several yards. Whereas they were all shooting over a fence, I was able to get low and include a nice foreground in my frame. Changing plans often means altering your composition. 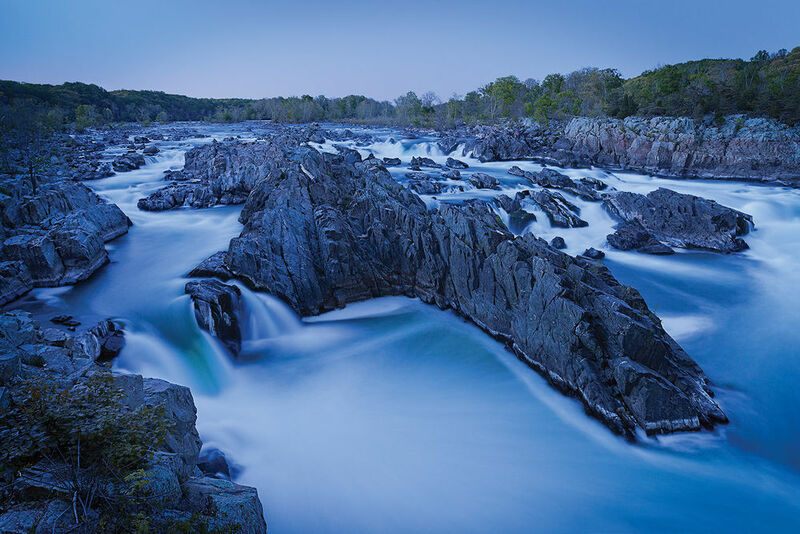 This can be as simple as moving the camera or swapping out the ultrawide-angle lens for a telephoto to capture just a fraction of the vista you intended to shoot. The important thing is to not be so constrained by your preconceived plans that you fail to take advantage of the abundant opportunities that are available. Sometimes doing as little as moving the camera around salvages an otherwise unproductive day. Boring sky? 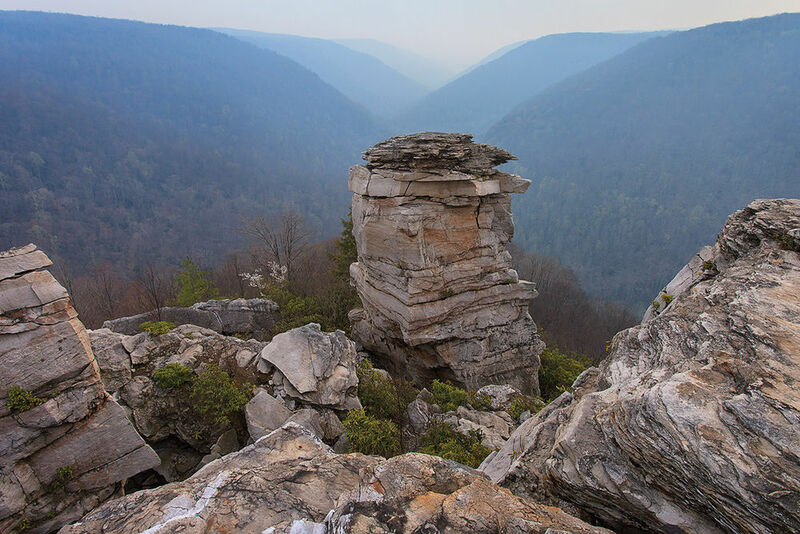 Make landscape features the focus, as Tennant did with this rock formation in Blackwater, West Virginia. Canon EOS 5D Mark II and 16–35mm f/2.8L Canon EF lens; 0.3 sec at f/16, ISO 320. Another category of the unexpected involves failing hardware. If you’re in a remote location and your only battery runs out of juice, it’s game over. However, there are less severe situations where being flexible and thinking on the fly can rescue your expedition. Perhaps in your haste to get to that waterfall you accidentally brought your tele instead of an ultrawide lens. Look for interesting patterns, textures, or reflections for a more abstract approach. Maybe on your hike to the summit you got a nasty scratch on your lens: Rather than shooting into the sun and exacerbating the resultant lens flare, wait until the sun has set. 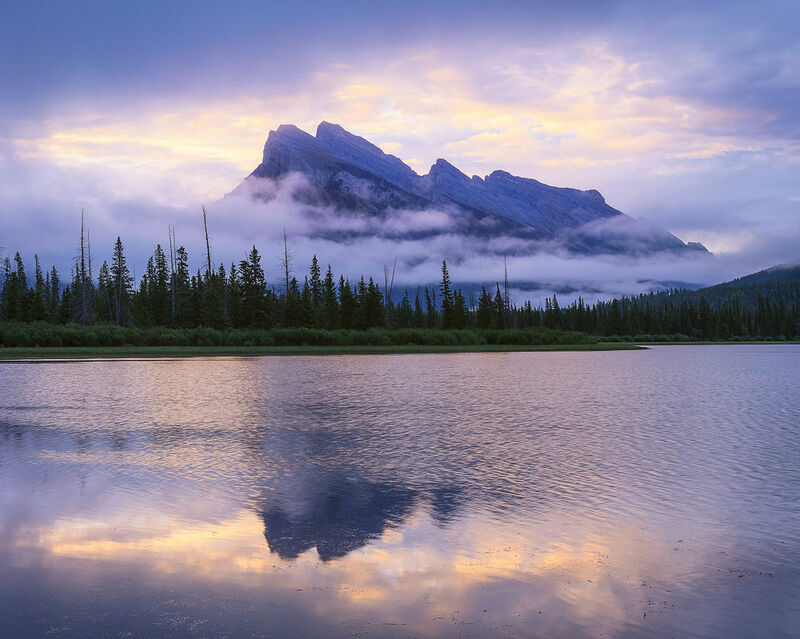 Tennant almost abandoned his Vermilion Lakes, Banff, post, but patience paid off when the clouds parted. Canon EOS 5D Mark II and 24–105mm f/4L Canon EF lens; 1/6 sec at f/11, ISO 320. The fact is that if you photograph long enough, you’ll inevitably create a handful of good images that can only be chalked up to happy accidents. 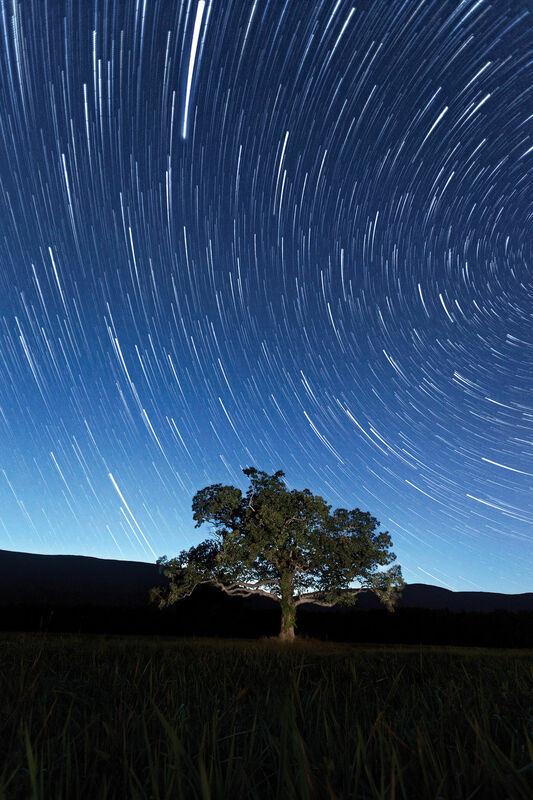 On one trip to the Catskills to capture star trails, I settled on a composition well before dusk and began shooting. Since photographing star trails is slow going and about as exciting as, well, watching the earth rotate on it’s axis, my friend and I left to go grab a beverage. My heart sank when I returned to my spot and found the front element of my lens completely covered in condensation. Hours of preparation and shooting down the drain. Or was it? Tennant captured this waterfall with a Canon EOS 5D Mark II and a 16-35 f2.8L Canon EF lens. Exposure: 20 Sec. @ f11 at ISO 320. After forging ahead and processing the images, I realized that as the condensation increased, the successive star trail images became more blurred. When I stacked them together in post, it created a mesmerizing meteor-like effect. Not only was the image salvaged, it turned out better than I ever expected. It also shows you should never delete images from your camera’s memory card in the field, no matter how poor you think the frames look at the time. For photographers who shoot outdoors, dealing with less-than-ideal conditions is a fact of life. But armed with these strategies and plenty of patience, I hope you’ll find the motivation to stick it out and create exceptional images in spite of the weather. ARTICLE WRITTEN BY: CHRIS TENNANT IN: POPULAR PHOTOGRAPHY MAGAZINE. THANKS TO POPULAR PHOTOGRAPHY FOR THE USE OF THIS ARTICLE.